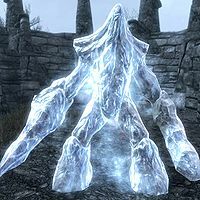 Pelagius' Frost Thrall is a nigh-invincible frost atronach that can be found in The Mind of Pelagius during the Mind of Madness quest, specifically during the "Pelagius' Paranoia" section. During this quest, two atronachs will be fighting arena style in a sunken box. Using the Wabbajack on the one assigned to you will cause it to change elements, possibly becoming this thrall. This page was last modified on 16 December 2018, at 19:45.